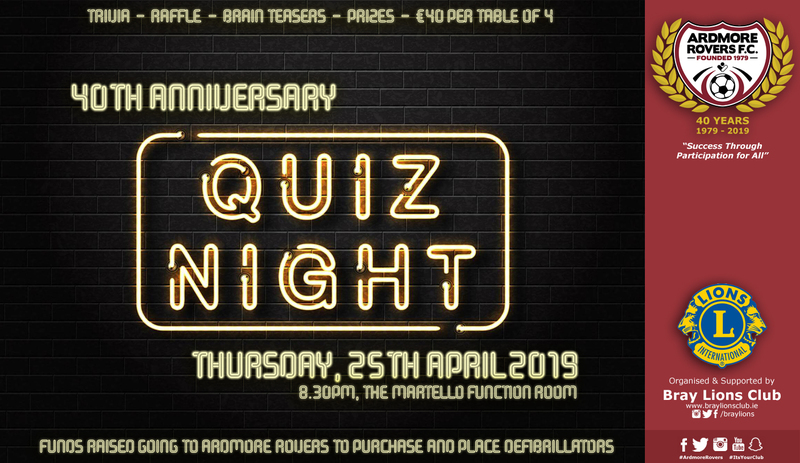 As part of our 40th Anniversary celebrations, Ardmore Rovers, with thanks to the Bray Lions Club, will be holding a fundraising quiz night on Thursday, 25th April, at 8.30pm in The Martello Function Room. It’s €40 per table of 4 and there will be a raffle and spot prizes on the night. A huge thank you to The Bray Lions Club who have very kindly offered to organised and run this event on our behalf in order for Ardmore Rovers to purchase and install two, potentially lifesaving, defibrillators, one in St. Kilians and one in Ballywaltrim. There is a large cost to buying and installing this equipment but it’s something the club feel is massively important. So please get a team together and come along for a night of fun trivia, spot prizes and who knows, you may even win something in the raffle?! We look forward to seeing you there on the night.